Plumbers rejoice! Make short work of your next aerator repair or replacement with our Aerator Gauge. Quickly identify thread pitch & diameter for 20 of the most common aerator sizes ranging from 1/4-18 to 15/16-27. This aluminum gauge features thread sizes in contrasting black print, cleanly tapped female holes to measure male aerator threads as well as male studs to measure female aerator thread sizes. 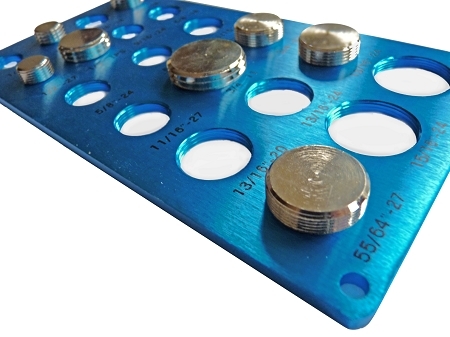 Carry in your tool box or use the pre-drilled holes for peg board mounting. This quality gauge is a must-have time and money saving tool for both the professional and DIY'er alike. *(M) Denotes tapped hole used to determine male thread size. 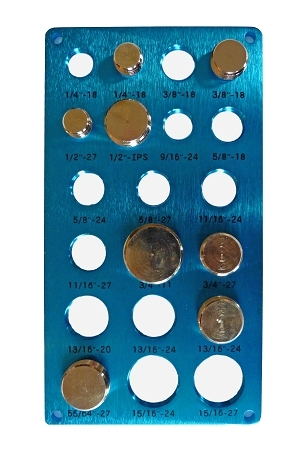 *(F) Denotes stud used to determine female thread size. Really well made and compact enough to fit in a smaller tool case. Very happy with quality and service. The faucet aerator thread gauge is excellent. Saves time, and is of great quality. Fast shipping and easy to deal with.